Timeless, elegant, chic wedding gowns are the ones that never go out of style, and most wedding gowns fall somewhere into that category. The styles might change slightly throughout the years, the cut of an A-line dress might go a little dramatic while the bodice of a mermaid cut becomes a little more revealing, but the overall style of a classic gown never fails. Of course, the wedding gown industry is filled with trends that come, go, change, return, and repeat every few decades, and that’s what makes it so exciting. No matter which gown you choose, classic or trendy, you allot a significant amount of money on this one purchase. Your wedding gown is the single most expensive item of clothing most women will ever wear, and it’s the most important piece of clothing women will ever wear. Your wedding gown is the dress you wear one time on the day that’s most important to you in your life. You become one family in this dress, and you begin living your dream life the moment you put it on and exchange your vows. You might only wear it once, but it will never lose its value to you. Because wedding gowns are so expensive, so important, and not unlikely to come back into style in a decade or so, many brides prefer to preserve their wedding gowns rather than hang them in the back of a dusty closet or pack them away in the bottom of an old box. If it’s too late to preserve your wedding gown, you can still restore it and then preserve it. If you’re unsure why you want to do this, here are some of the most common reasons. Your wedding day was one of the most fund days you’ve ever had, but did you get out of it without a spill, a stain, or a mark on your gown? From your great grandmother’s lipstick on your strap to your slightly shorter bridesmaid’s makeup on the front where she hugged you, stains happen. Perhaps someone got a little too excited on the dance floor with a glass of red, and you subsequently dragged your train right through that spill while showing off your stellar dance moves. 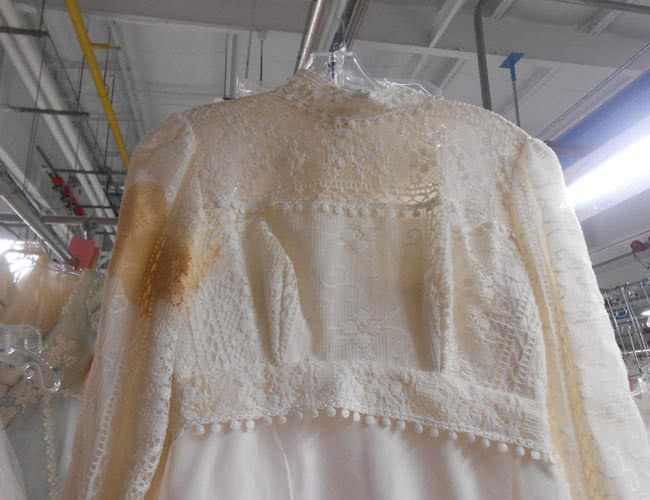 Whatever it is, you probably have at least one or two stains on your wedding gown. It’s not uncommon, but it’s also not the end of the world. Stains can be specially treated, lightened, and even removed in many cases. If you’ve avoided preserving your wedding gown to this point because all the stains it incurred throughout the night, don’t give up on your dreams. 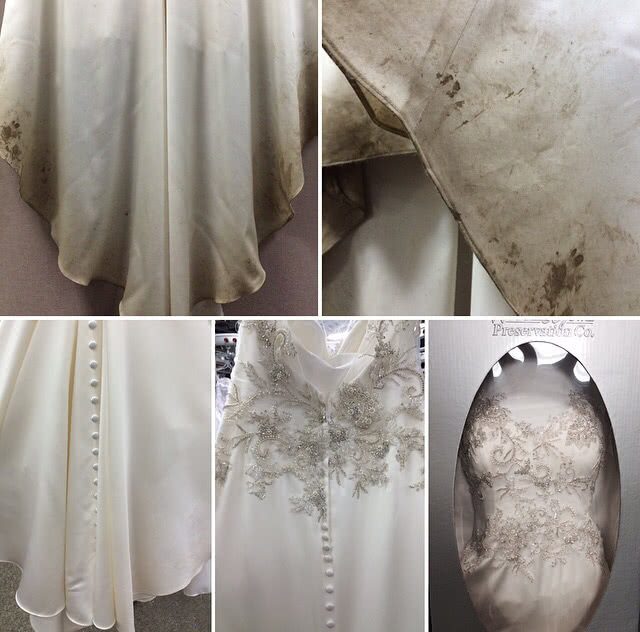 There’s still a chance professional restoration can handle even the toughest stains, creating a wedding dress that appears brand-new and absolutely perfect. Time is a thief, and perhaps the most devious thief of all. It goes by so quickly, and you never get it back. The art of wedding dress restoration changes that fact, however. With our amazing wedding dress restoration service, we are able to turn back the hands of time to provide your wedding dress a chance at its full glory once again. A gown that’s yellowed after being stored inadequately for decades can be painstakingly restored to its former glory, and you can see it in all its glory once again. This is a lovely opportunity for anyone with a sentimental gown that’s old, delicate, and seemingly destroyed. The hands of time take a toll on fabric, but our team of restoration artists can reverse the signs of aging on virtually any fabric of any age. 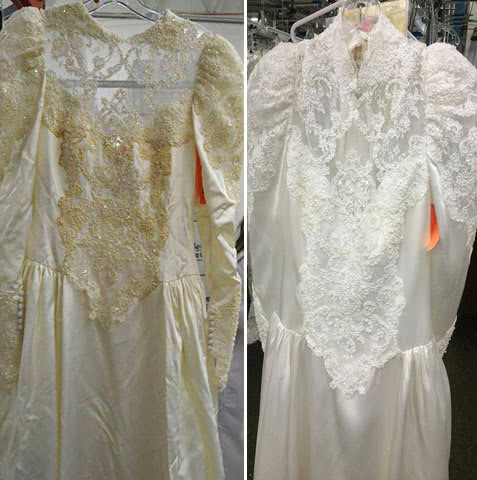 Your great grandmother’s wedding dress from the 1800s isn’t the loss you think it might be. There’s a chance it can be restored and preserved for you for generations to come. One of the main reasons brides turn to gown restoration is the sentimental value of this art. As we said before, your wedding gown might be the most expensive garment you’ve ever purchased. More importantly, it’s the dress you wore the day you began your forever with the love of your life. What this means is it holds a lot of sentimental value for you. Your gown should be restored so you can preserve it, show it off to your kids one day, and even pass it down to your daughter, your granddaughter, or even your daughter’s granddaughter someday. Remember when we said all things come back to style at some point? Your daughter might not want your wedding gown, but it’ll be vintage by the time your granddaughter gets married. Imagine being able to present her with a designer gown lovingly and perfectly preserved after the restoration process so many decades before. Her love of vintage gowns might encourage her to wear your gown on her own wedding day. You never know, but wouldn’t you love to find out? Because Modern Cleaning Technology is Amazing! 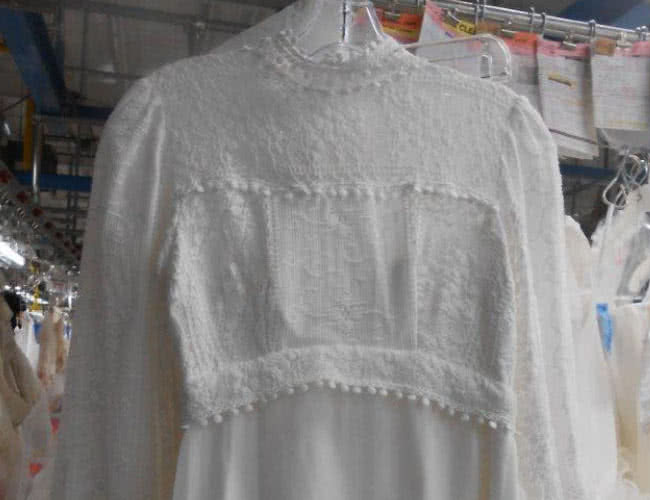 Many brides fear their own wedding gown is far too gone to restore. Perhaps the idea of restoring a gown with deodorant stains, a smear of lipstick, or some red wine on it is simple in comparison to the issues you have. 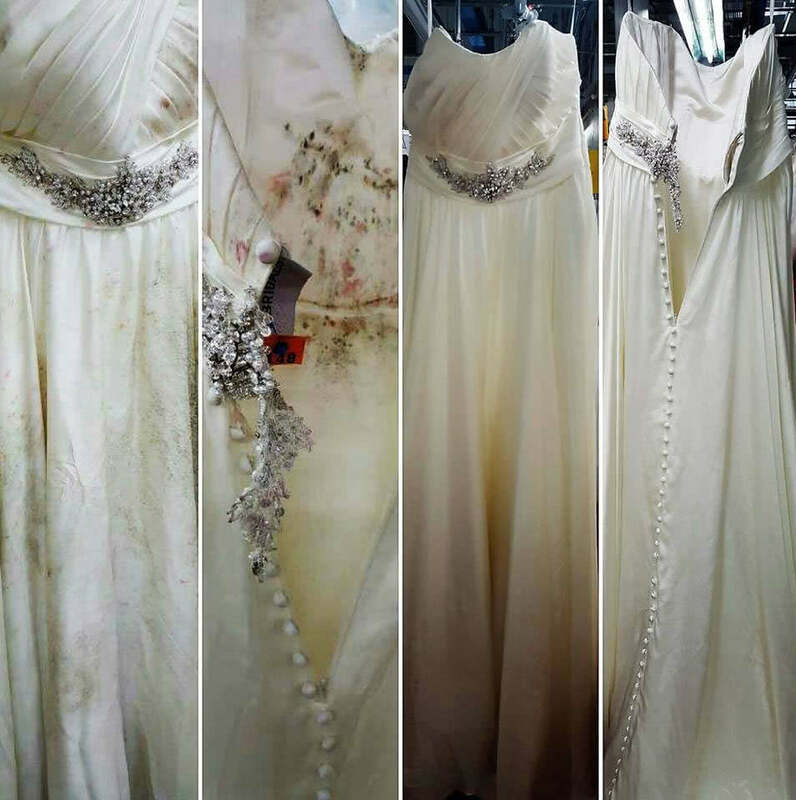 Was your wedding gown damaged in a flood, a fire, or another natural disaster? Many brides fear their gown has been destroyed by something they never saw coming, and they feel their hearts break when they realize their gown was part of the damage of such a tragic event. 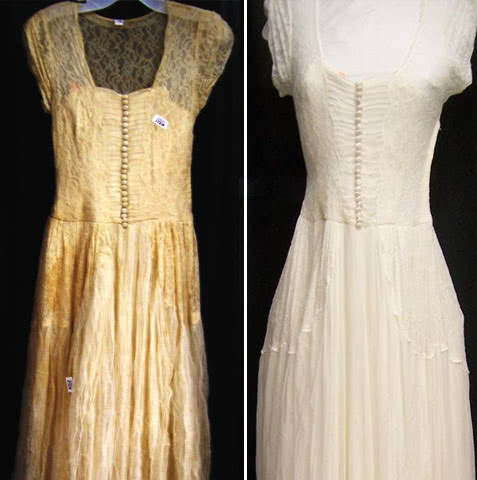 While there is never a guarantee that the extent of damage your dress incurred is capable of being restored, you’d be quite surprised what we can accomplished when we restore gowns. Whether they are covered in soot following a fire, wet after a flood, or damaged in some other way, we might be able to restore your gown. Our delicate process is able to help gowns that seem far too damaged to repair, and that’s what sets us apart from the crowd. If your dress was damaged in a horrible accident, let us see what we can do for you. We always off your money back if we are unable to repair your gown to its full glory, so there is no reason not to try. It’s a fad, but it’s one that hasn’t seemed to go away in the past few years. Call it silly, call it genius; call it whatever you want, but the photos brides post online on sites such as Pinterest and Instagram are filled with photos of women in the middle of the ocean kissing their new husband. They’re riding horses, playing baseball on a field, and standing in their gowns in the middle of a football field getting dirty and athletic with their new husband. The concept is amazing, but many brides are upset following the Trash the Dress photoshoot when they realize just what they’ve done. Sure, the photos are fun, and everyone will love them, but the dress is now destroyed. We’ve been able to take gown destroyed by the most amazing Trash the Dress photo shoots and turn them into perfect gowns once again. Our modern technology is amazing, and there is very little we are unable to do. In fact, we can almost guarantee so long as your dress is not so old it’s brittle or exceptionally frayed, we can restore any damage you might do taking these photos. Your wedding gown is everything to you, and that’s why you want to restore it. It’s hard not to worry that someone is spilling on you, that you might make a mess on your wedding day, and that your dress might not come clean, but your big day is not for your tears or worry. It’s for your smiles, your happiness, and your tears of only joy. Don’t let the idea of your dress being forever ruined top you from having the time of your life. We can help you with that. Let our restoration services provide you with peace of mind when something unexpected occurs. You don’t need a reason to want to restore your wedding gown. It’s your gown, and you can restore it for no other reason than you just want to. These reasons are all great ones, but it’s what’s in your heart that matters the most. Let us help you make your dress dreams come true by restoring it to the beautiful state it was in the day you tried it on for the very first time. It’s our gift to you. Take a look through our wedding dress restoration before and after gallery to see how we've helped thousands of brides from the past restore their wedding gowns.